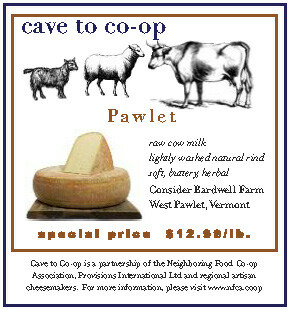 Consider Bardwell Farm in West Pawlet Vermont is a producer of award winning handmade cheese from goat and cow milk. Spanning the rolling hills of Vermont's Champlain Valley and easternmost Washington County, New York, 300-acre Consider Bardwell Farm was the first cheese-making co-op in Vermont, founded in 1864 by Consider Stebbins Bardwell himself. A century later, Angela Miller, Russell Glover, Chris Gray, and master cheesemaker Peter Dixon revitalized the tradition with goat milk from a herd of 100 Oberhaslis and cow milk from Lisa Kaimen's herd of 30 Jerseys. Rotational grazing on pesticide-free and fertilizer-free pastures produces the sweetest milk and the tastiest cheese. Consider Bardwell cheeses are made by hand in small batches from whole, fresh milk that is antibiotic and hormone free. Only microbial (non-animal) rennet is used in their cheese making. All cheeses are aged on the farm. Raw Jersey cow milk is the basis of Pawlet, an Italian-style mountain toma, and it is aged 4 – 6 months. Flavors are mild, buttery and rounded, with hints of flowers, grass and savory herbal notes. A creamy texture and bright bite makes this a great sandwich cheese or an appetizer with broad palate appeal. It is a versatile cheese, like the town of Pawlet itself, which provides the farm with slate, syrup, and timber. Here are some recipes that use the creamy buttery flavor of Pawlet. Bring the milk and water to a rolling boil in a large heavy saucepan. Add the salt and gradually pour in the polenta, stirring constantly. Continue stirring and cook for 3 to 5 minutes until the polenta thickens and pulls away from the sides of the pan. Remove from heat and stir in the butter and cheese. Serve with a bowl of extra grated Pawlet at the table. This polenta can also be poured into a buttered pan and cooled until solid. When cool, remove from pan and slice as desired. Sauté the slices of polenta in butter until crisp and golden. Serve with a simple tomato sauce and extra cheese. You can also slice the cool polenta and layer it in a casserole dish with any type of pasta sauce, vegetarian or with meat, much like lasagna. Or use slices of polenta to top a casserole, much like shepherd’s pie. Drain the water from the currants and set aside. In a large nonstick pan, heat the olive oil over a medium heat. Add the onion and cook, stirring occasionally, until limp but not brown, about 7 minutes. Add the greens, cover, and cook until wilted and very tender, about 7 to 9 minutes. (If it looks dry, add water 1 tablespoon at a time). Turn the heat to medium-high and add the vinegar. Cook until the vinegar aroma dissipates, about 1 minute. Add currants, pepper flakes, and plenty of salt to taste, and mix well. Remove from heat and put chard mixture on a plate to cool slightly. Do not wash the pan. To assemble: Oil one side of all of the bread slices. Place 4 slices of bread, oiled side down, on a cutting board or counter. Distribute the greens mixture over the bread slices, followed by the cheese. Place remaining bread, oiled side up, on top of the cheese. Preheat the same pan you used to make the chard over a medium-high heat for 2 minutes. Put the sandwiches into the pan and, using a spatula, press firmly on each sandwich to flatten slightly. Cover and cook for 3 minutes. Remove the cover and turn the sandwiches, pressing each one very firmly with a spatula to compress the bread slightly. Cook for 2 minutes or until underside has begun to brown in places. Carefully turn the sandwiches once more, pressing with the spatula again, and cook for 30 seconds to 1 minute, or until cheese has melted. Remove from the pan. Let cool slightly, and serve. Bake the potatoes directly on the upper rack of the oven for 40 minutes, or until tender. Spread the fennel wedges in a shallow glass baking dish and drizzle with the wine and olive oil. Season with salt and pepper. Cover the dish with foil and bake in the bottom third of the oven for 40 minutes, or until the fennel is tender and golden brown on the bottom. Let cool slightly, then chop. Cut 8 slices from the Pawlet and cube the remaining cheese. Heat the milk in a small pan, add the cubed cheese and stir until melted. Halve the warm baked potatoes lengthwise. Scoop out the inside of the potatoes into a bowl to within 1/4 inch of the skins. Using a masher or a large fork, coarsely mash the potatoes with the butter. Pour in the hot milk mixture, add the garlic and mash the potatoes until smooth and fluffy. Stir in the chopped roasted fennel. Season with salt and pepper. Spoon the stuffing into the potato skins and transfer to a baking sheet. Top each potato half with a slice of the remaining cheese. Bake the potatoes in the upper third of the oven for 12 minutes, until they are hot throughout and the cheese is melted. Cool slightly and serve.